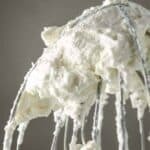 This stabilized mascarpone whipped cream is my all-time favorite – and based on the number of times it’s been pinned, yours, too! It’s light and airy – perfect to top cupcakes or ice cream, dip fruit in, or just eat by the spoonful! When it comes to frosting, the first thing I always do is assess if my favorite stabilized mascarpone whipped cream would be a good fit. It’s my default, go-to recipe. Frankly, it’s hard to imagine something that it wouldn’t go well with, but I suppose I’m slightly biased. It’s light, airy, and super easy to pipe with any kind of decorating tip. You could also just use an icing spatula to frost a cake. There are even more posts where it’s been used but not mentioned by name, so if you feel like playing a game of “Where’s Waldo?”, start looking through the archives! This isn’t the kind of whipped cream you get from an aerosol can. 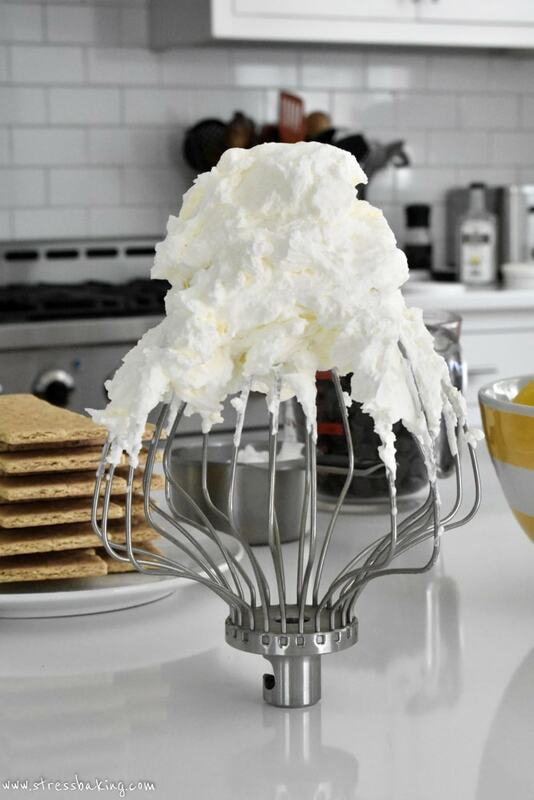 That kind of whipped cream loses its shape as it sits, and eventually gets melty and less than appetizing. But this whipped cream? It’s perfect. It won’t lose it shape (and I’ve had it on top of cupcakes for multiple days and it never budged) and it won’t melt at room temperature. Now, if you take it to a BBQ that’s outside on a 95 degree day… I can’t make any promises. I start melting at that point, so you can’t blame the whipped cream. It can support garnish, like fruit or sprinkles, without any trouble. Although, full disclaimer: if what you topped it with has color (like rainbow sprinkles or strawberries), it will eventually bleed into the whipped cream. So don’t top it until just before serving! Once you’ve made it, you don’t need to re-whip it to get back the right consistency – it stays exactly the way you made it (as long as you store it in the fridge). It can go on anything! Cupcakes, cake, ice cream, pie, brownies, hot chocolate, fruit, your face, macaroni and cheese… wait, not that last one. My favorite mascarpone cheese is the classic BelGioioso in the white and green container, and I can usually find it in any grocery store. Make sure it’s fresh out of the fridge and cold – it makes a difference! If you’re fancy schmancy and you have one of those stainless steel whipped cream dispensers, load it up! I’m not fancy, so mine just goes into a sealed plastic container… if there’s any left to store, which isn’t often. Seriously. One time I made a half batch of this and just sat down on the couch and ate it with a large spoon, right out of the mixing bowl. Okay, fine – it was a full batch. And maybe it was more than once. But once you make this, you will in no way judge me. …okay, maybe you’ll still judge me a little bit. Not sure what kind of vanilla to use? I make my own using vanilla beans and vodka, but that requires a lot of planning ahead! So if you’re tight on time, I highly recommend this Nielsen-Massey Madagascar Bourbon Vanilla Extract. It’s on the pricier side, but I truly believe it’s worth it. If you need to keep things budget-friendly, Rodelle pure vanilla extract is always a solid choice. Also, you definitely want a KitchenAid for this recipe, because your arm is going to get tired if you use a hand mixer. Don’t have one? Check out the Shop page to stock up on my favorite mixer, and other kitchen essentials for this recipe! This stabilized whipped cream is my all-time favorite! It’s light and airy – perfect to top cupcakes or ice cream, dip fruit in, or just eat by the spoonful! Chill a large mixing bowl in the fridge. In your chilled bowl, combine mascarpone cheese and sugar on a high speed until completely combined. Add vanilla and heavy cream, and mix on a low setting until it is mostly combined. Now increase speed to high and whip until stiff peaks form – it may take a little while, so be patient! Once cupcakes have completely cooled, fit a piping bag with desired tip and go to town with frosting your cupcakes. I really like this recipe but made way too much. Have you ever tried freezing it? Thanks! I haven’t, and I don’t believe it would work out well, but anything is worth a shot, right? However, you can keep it in the fridge in an airtight container for a few days and give it a quick whip before you use it again. I haven’t tried that before, but it might be a little too fluffy and “soft” for that. If you give it a try though, let me know how it turns out! Hi Leslie, I’m very excited to try this recipe. I see you call this a stabilized whipped cream but I don’t see any stabilizer in it. I would like to use this mascarpone whipped cream to frost and pipe onto a Genoise cake. Would I need to add a gelatin stabilizer in this recipe?. It’s stabilized by the combination of ingredients, mainly because of the mascarpone cheese! It should work perfectly for your cake! This worked beautifully for me, I whipped it up this morning and then kept it in the fridge until tonight when I used it to top a French lemon cream pie. I like that the mascarpone doesn’t add any flavor to it, it really just tastes like delicious pure whipped cream but it has a little more body to it. I decreased the sugar due to personal preference. If I make this and have cupcakes for a catering tomorrow, would it be better to wait until tomorrow to frost cupcakes? If I frost cupcakes tonight do they need to be refrigerated overnight? I don’t really want to put cupcakes in the fridge…. thank you for your advise! I’m so sorry that I’m just getting back to you – I would definitely wait until the day of the event that you are serving your treats so that you can store the frosting in the fridge and the cupcakes elsewhere. 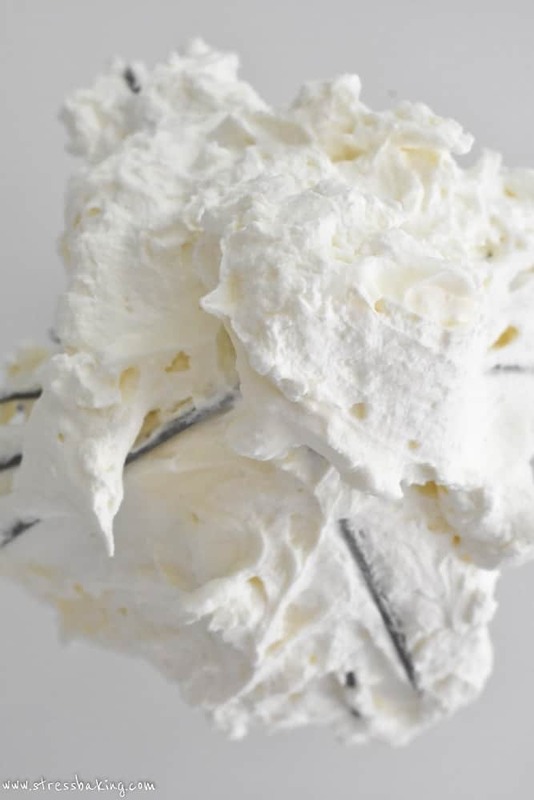 The fact that the mascarpone doesn’t add any kind of overwhelming flavor is one of my favorite parts about this whipped cream – I’m so glad you liked it! Used this to make an awesome Watermelon Cake. It held perfectly while traveling to a neighbor state to celebrate a family birthday. Thanks! Never made a strawberry shortcake before. Will this be appropriate to put on a cake like that? Why did the solids and liquid seperate while whipping it? It’s as if I made butter. This truly has been. My go to! I have used it as filling for dessert dumplings WOW! Yay! That sounds fantastic – thank you for sharing! Won a key lime pie contest using this recipe adding raspberries as the topping! Wow, that’s so awesome – I’m so happy to hear that! Namaste from Mumbai…! We don’t get heavy cream here n all I have been using is non dairy whipped cream which is sweet as well as flavoured… What do u suggest.. Do I use it and keep the sugar ratio same. Also if u can share the same recipe in gms.. Pls.. TIA..
I’m sorry, I’m not sure what kind of substitute will work the same way as thing as I haven’t tried it myself. There are also some great recipe converters online that will give you the amounts in grams! I am making a white 6 layer cake and normally fill and crumb coat with buttercream. I depend on freezer/ refrigerator intervals to keep everything nice and firm. Do you think this recipe is capable of achieving a level firmness to properly support and coat this type of cake. It sounds delicious and I am willing to give it a try on a test cake but any preliminary help would be appreciated. Thanks for sharing this! Hi there, so sorry for the delay! I’m not sure that it would suit the purpose you describe just because this frosting doesn’t crust the way a buttercream does – but it can be beautiful when it’s piped or used as the outer layer of frosting! Thanks so much. I will try it as a filling and hope that I don’t eat it before it makes it into the cake. I’m not gonna lie to you – that’s gonna be hard! Yesterday there was a party in my family, we made this cake. It was very awesome!!!! Everobody praised of this cake. I am italian and here we don’t love buttercream too much, but in this period I have a passion for the cupcakes decoration and I would love to manage piping many types of flowers. 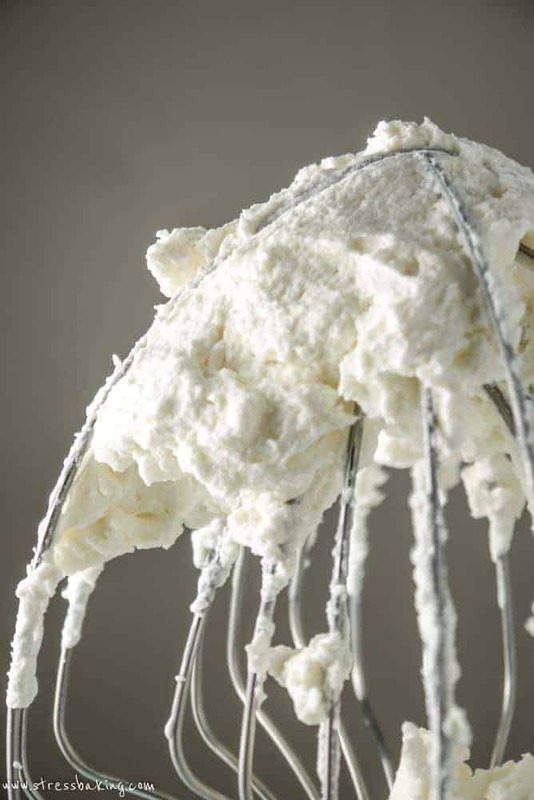 Do you think that this cream/mascarpone frosting would substitute the buttercream with the same results? It won’t be the same. This is more of a whipped cream consistency and doesn’t crust the way buttercream does. So you could certainly pipe flowers, but it’s not going to give you as clean a look, and won’t hold the same way that buttercream would. Thank you so much for your quick and detailed answer Leslie!!! Yes, but taste it along the way to make sure it’s to your liking. What about adding colour to mascaporne cheese? Can we use a water based colour or strictly gel based one like in the case of cream cheese. I think if I reduced the amount of heavy cream a bit, I could get away with substituting honey for the sugar. I’m going to try it, and I’ll let you know how it goes. Ok, I used 1Tbsp more mascarpone and then added 1/4 cup Trader Joe’s Turkish Honey instead of granulated sugar. It whipped up beautifully, and has a delightful, lightly sweet flavor. I used it for filling and topping an almond flour carrot cake, so all in all, very low carb (for a cake) but amazingly moist and flavorful, and the icing is perfect. Thanks for a great recipe! Thank you so much for sharing! I’m so glad it worked out for you – I’m going to have to try that adjustment myself! I use frozen fruit every time I make this it adds great flavor and color! use agar to stabilize your whipped cream.